3M has acquired the company Elution Technologies as of September 7, 2017. The acquisition enables 3M to add a new product to its portfolio that enables food and beverage companies to test for allergens such as peanuts, milk or soy. Testing for allergens has become increasingly important in the food industry. To find out more about this acquisition, please visit the 3M website. Since the introduction of FSMA, food safety has been under a much-needed magnifying glass. Standards for hygiene and accountability are increasing, and companies are implementing more measures to keep consumers safe. One of the ways in which businesses are being proactive is through implementing color-coding plans. If you have not heard of this type of plan yet, it’s time to get schooled; and if you have, this article will provide a quick refresher on why companies are expanding their spectrum on contamination prevention—by literally implementing the color spectrum in their plants and businesses. What Is A Color-Coded Plan? A strategy for a plant or business that designates certain colors for a specific area or purpose designed to promote safety and cleanliness. Example Plans. Although color-coding plans vary by the needs and demands of each plant, the following are the most popular types of color-coding plans currently being practiced in food manufacturing. Food Processors and manufactures usually have identified potential allergens and contaminants that pose a risk to the production process. Color distinction for equipment or instruments that come into contact with these potential contaminants is an ideal tool for food safety. Determining the amount of items that fall into this category within your facility is the first step to selecting the appropriate amount of colors to implement. The most basic color-coding plan for this purpose would be to select one color to represent tools that come into contact with a particular risk agent and one color to represent those tools that may be used elsewhere. If a plant has more than one risk agent, this plan may be expanded to include several colors. It is important to remember, however, that simplicity is key in color coding and that additional colors should be implemented strictly on an as-needed basis. Many plants already have identified zones in place based on what is produced in each zone or simply due to operating a large plant. This presents an ideal opportunity to color code zones to keep tools in their proper place. Certain plants that have a large number of employees working different shift times should also consider color coding. Color coding by shift can hold each shift responsible for proper tool use and storage. This approach also allows management to see where work habits may be falling short and where the cost of tool replacement is highest. Plants that have assembly line-like processes can implement color coding if necessary to differentiate tools that belong to each step. For example, this becomes particularly important in plants that deal with products such as meat; obviously you do not want to use the same tools with raw and processed meat. Color coding eliminates the question of whether or not a tool is meant for each step in the process. 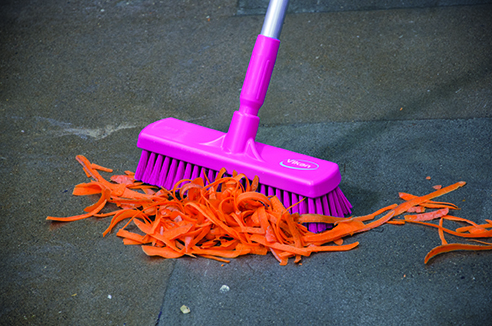 Implement a two-color-coding plan to distinguish between tools used for cleaning versus sanitation. 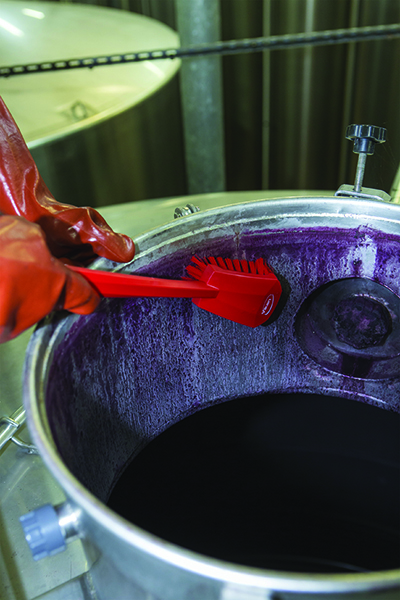 For many food plants, cleaning and sanitizing are processes that are considered different in purpose and practice. Often, there is a specific list for cleaning and then a separate plan for sanitizing. Implementing a two color-coding plan can distinguish tools that are meant for each process. It helps meet FSMA requirements. A major part of complying with FSMA regulations is having proper documentation to prove safety measures. Color-coding plans do exactly that, and most providers of these products can provide you with the necessary documentation. It reduces pathogens and allergens contamination. For food producers, this is the most important reason to implement color coding. There is nothing worse for a company than experiencing product contamination or a recall; this is one step that may prevent such events from occurring. It is easy to understand. Color coding works so well because it is so simple. All employees, even those who may not speak the same language or are unable to read posters and manuals that dictate proper procedures, can easily comprehend it. It creates a culture that holds employees accountable. Managers enjoy color-coding practice because it is a simple measure that really works to hold employees accountable in the proper use of tools. It becomes much more obvious when a brightly colored tool is out of place, and thus workers are more likely to follow proper procedure. Undeclared allergens are the cause of a great number of recalls in the United States, causing significant consumer health issues, scrap costs, and sourcing conundrums. Under FSMA, good manufacturing practices are undergoing revisions, and the one area that has gotten the most attention is allergen control. Undeclared allergens were responsible for the greatest number of recalls in the United States in 2013, causing significant consumer health issues, scrap costs, and sourcing conundrums. Under the Food Safety Modernization Act (FSMA), good manufacturing practices (GMPs) are undergoing revisions — and the one area that has gotten the most attention is allergen control. Under the new GMPs, an emphasis has been put on facilities to have an allergen control program. Further, 15 million Americans and 17 million Europeans have documented food allergies. According to a study released by the Centers for Disease Control and Prevention (CDC), food allergies have increased by 50 percent among children from 1997 to 2011; and hospital admissions for severe reactions have increased seven-fold in Europe over the past decade, according to the European Academy of Allergy and Clinical Immunology. FSMA’s Proposed Rule for Preventive Controls for Human Food has two major features–provisions requiring hazard analysis and risk-based preventive controls, and revisions to the existing Current Good Manufacturing Practice (CGMP) requirements found in 21 CFR part 110. Included within these revisions is the requirement that each covered facility prepare and implement a written food safety plan, which includes a hazard analysis, preventive controls (e.g., process controls, food allergen controls, sanitation controls, and recall plan), monitoring procedures, corrective actions, verification activities, and recordkeeping. Allergen Control Programs are multifaceted with elements ranging from ingredient supplier verification, storage, scheduling, formula and rework control, sanitation and changeovers, and label verification. In essence, there are two main goals of an allergen control program, which appear simple on paper, but are very difficult to execute. Goal #1: If you make a product with an allergen in it, you need to make sure that the allergen is declared on the label. Goal #2: If you make a product that is NOT supposed to have a specific allergen in it, you need to do everything possible to prevent cross-contact. So how can you make the most of your Allergen Control Program? Use these 6 Best Practices in this e-book, co-produced by TraceGains Inc. and AIB International. Click here to download. Are you ready for audit? Gary Smith, Director of training and improvement solutions at SAI Global, talks about the top 10 GFSI non-conformances for SQF & BRC audits. Many companies do not know what a business continuity plan is. It is not a recall and performing a mock recall will not count as an annual test and review. It is the continuing of business with a disruption in the supply chain. What are your plans for a key supplier going out of business or being affected by a natural disaster? If there is a fire or accident at one of your facilities, how are you going to ensure that your customers will still get delivery of your product? HACCP has been around for years, but this is still a major area of focus. HACCP must be implemented and individuals must be properly trained in HACCP. All Critical Control Points (CCPs) must be validated. Review supporting documents during annual check. Is the flow chart current? Is the hazard analysis still correct? Question your employees during your internal audit. Get your employees used to and comfortable with answering questions about the food safety plan. Utensils (scoops, shovels, belts, etc), equipment, and all food contact surfaces must be designed and in good condition so as not to be a food safety risk. Implement a foreign material control plan. Have a preventative maintenance schedule. Focus the internal audit program on equipment, not just employees. Use a flashlight when conducting internal audits. Train, empower, and reward production employees to identify equipment defects. Do not have temporary repairs. Allergens are the number one cause of recalls. You must have a good allergen control program and this program must be validated. Identify ingredients as allergens at receiving and have a label inspection program. Specific allergen proteins must be validated with surface testing and product testing. Allergens must be listed as hazards in hazard analysis with the control as the allergen management program. Have a strong internal audit program that emphasizes proactive solutions to avoid non-conformances. Manage non-conformances with a corrective action program. Take photos of all findings during internal audits. Make the process as formal as possible. Dress like the auditor would and ask employees questions. Tape, cardboard, and construction plastic sheeting must not be used as these surfaces cannot be cleaned. Doors and windows must be properly closed. If an auditor asks you about a product, you must be able to list all the raw materials, where they came from, and how they were processed to create your product. Keep the recall team current. Have procedures for a mock recall and always perform it. Make the mock recall a real test. Include ingredients and packaging in all traceability programs. Perform product trace exercises during the internal audit. Make sure that your records are legible, authorized, and that demonstrated activities are taken. This is a new standard. Companies are now required to have documented procedures in place for when calibration equipment is down. If you’ve achieved food safety certification, congratulations! However maintaining certification takes commitment and dedication. Be sure to maintain a strong food safety culture within your organization. Communicate well across all levels of the company. Have a strong internal audit program and don’t be afraid to identify issues and focus on corrective action management.